They called him “Madman” Muntz. But Earl Muntz, a used-car dealer known for his crazy billboards and radio ads in Southern California during the 1940s, made millions in the business while also manufacturing and selling televisions, car stereos and what is now a collector’s automobile. His story is so interesting a California couple has produced and directed “Madman Muntz: An American Maverick,” a film documenting his life and career which is now hitting the film festival circuit. Bunker said he first learned of Muntz about a decade ago. “I learned about him when I was working as a writer of television game shows back in the mid-1990s,” Bunker said. A man Bunker knew in high school called to see if he would be interested in coming to a car show up in Tehachapoi, Calif., where collectors of the Muntz Jet were gathering. The Muntz Jet was an aluminum-bodied sports car designed in the early 1950s by Frank Kurtis, who later developed Indianapolis 500 race cars. Kurtis built about 20 of them, but lacked production resources. Bunker learned that a man named Earl Muntz bought the manufacturing rights, redesigned the vehicle for the public, and later produced a few hundred, which he lost money on. Following the car show, Bunker learned a lot more about the Muntz story and saw that he had some great material for a film. “Judy and I had been thinking about making a movie for years,” Bunker said. Eventually, the couple met up with James Castoro, a businessman from Muntz’s hometown of Elgin, Ill., and they had their financial backer. Bob Renwick, 86, worked for Muntz in Elgin from 1935 to 1941. “I started by washing cars, five for $1,” he said. Later, he and his five brothers worked as salesmen at Muntz’s lot. “Earl could sell a car to a man that didn’t want a car,” Renwick said. “He was a genius.” Renwick went on to run his own lot in Elgin called Renwick Motor Sales, from 1945 to 1988. In 1941, Muntz traveled with his third wife — he would marry and divorce seven times — to his in-laws’ home in Southern California. “He found out that cars were selling for twice as much as they were in Illinois,” Bunker said. So Muntz opened up a lot in Glendale, Calif., and later another lot in Los Angeles. Eventually, it became too expensive to transport vehicles from Illinois so Muntz closed the lots in the Midwest and stayed in Los Angeles. It was there he met up with Mike Shore, an “advertising genius” who was charged with coming up with gimmicks to sell vehicles, ver Mehr said. “Shore was the one who came up with the idea to advertise on billboards,” ver Mehr said, “which no used-car dealers were doing at the time. “Mike Shore said that ‘People were already sitting in their downpayments,’ when they saw the billboards.” His ads would state: “I wanna give ’em away, but Mrs. Muntz won’t let me. She’s CRAZY!” Muntz also began advertising on the radio, and Shore’s campaigns would have a Muntz caricature dressed in red full-body BVD underwear, wearing a hat like Napoleon, which became the Muntz icon. 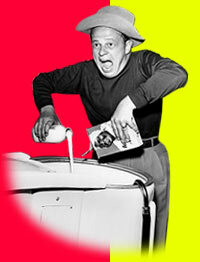 Ver Mehr said Muntz’s advertisements were so odd, that one local classical radio station refused to play them. “They thought they were too unsophisticated,” she said. So Muntz and Shore came up with a commercial that played over classical music. “They would play Brahms or Beethoven or Mozart music,” Bunker said, “but have lyrics over it talking about used-cars.” The radio station ran the ads. Muntz knew his ads had become well-known when he was listening to a famous comedian of the time comment about the used-car ads on the radio, ver Mehr said. “He heard Bob Hope tell a ‘Mad Muntz’ joke,’” she said. Other comedians of the day, like Red Skelton and Jack Benny, also joked about Muntz in their routines, which illustrates the penetration of the Muntz campaign. “From 1942 through 1947,” Bunker said, “Muntz was the largest-volume used-car dealer in the world.” He also rubbed elbows with stars of the day, like singer Rudy Vallee, Bert Lahr (the Cowardly Lion in “The Wizard of Oz”) and Gene Autry. By 1945, Muntz’s used-car lot had actually become part of the Hollywood bus tours that also visited Grauman’s Chinese Theater and the famous “Hollywood” sign. However, Muntz would make very little profit on his vehicles, and sometimes lost money. The filmmakers said one of Muntz’s slogans was, “I buy ’em retail, but sell ’em wholesale,” and he may have lost money on some deals because of it. “There was a story that a customer bought a car from his one lot,” ver Mehr said, “and sold it to Muntz’s other store and made a profit.” Still, Muntz’s son claimed that Muntz netted at least $1 million in 1947 from his business, ver Mehr said. Later, Muntz got into the black-and-white television business, learning how to make cheap “Muntz Televisions,” the first to be sold for under $100, according to the filmmakers. Muntz’s most famous contribution to television is that he reportedly was the first person to come up with the moniker “TV.” The story goes that Muntz bought skywriting planes to fly over Los Angeles advertising “Muntz Television,” but by the time the plane was in the middle of writing “Television,” Muntz’s name would already be dissipating. So Muntz reportedly shortened the word to “TV,” and the rest is history. The filmmakers added that Muntz’s daughter, who provided archival information, including home videos of Muntz, is named Tee Vee. Later, as color television replaced black-and-white television, Muntz went bankrupt, receiving $200,000 for his stock which once had been worth $6 million. Muntz’s third fortune was made in selling four-track car stereos, called the Muntz Stereo Pack. These were the precursors to 8-track car stereos. In the 1970s and 1980s, Muntz was involved in the sale of everything from satellite dishes to all-aluminum homes. When he died in 1987, he reportedly was the Los Angeles retailer of a new technological wonder — the cellular phone. Today, his Muntz Jet, which was his biggest money-loser, remains a valuable collector car, selling for as much as $70,000. The Sarasota, Fla., Classic Car Museum recently added a Muntz Jet exhibit, and also held a viewing of “Madman Muntz: American Maverick” earlier this year.